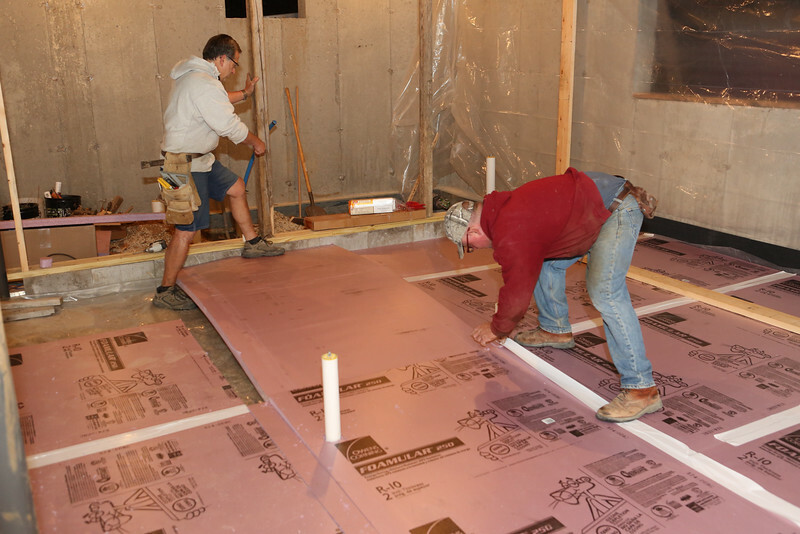 On October 22nd and October 30th, 2014, the Fall projects at Grandview Road included plumbing for the basement, floor and wall preparation with heated floor tubing prior to concrete pouring; and on November 8th finishing the concrete floor. Here you will meet some of the friendliest and most talented "hands-on" talent in the building trades including Steve (plumbing), Jonathan (Lonna's father) and Chester (heated floor installation including insulation and tubing) and of course Myron (general contractor and man of many talents). On Saturday, November 8th, two mixer trucks with concrete arrived as Mike O'Brian and his crew of 5 Concrete Guys work continuously for nearly four hours to finish the entire floor. Take a close look at the talent and processes required to do the job right. And take a look at the seasonal changes in the extended site at 6438 Grandview as Fall wanes and the days continue to get shorter....and colder.